Drapes can be a tricky element in a room. I tend to lean toward full long panels of drapes with a puddle, lined in felt. Why felt? 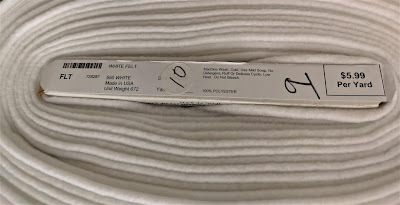 Drapery lining, even blackout lining doesn't add much weight to drapery panels. 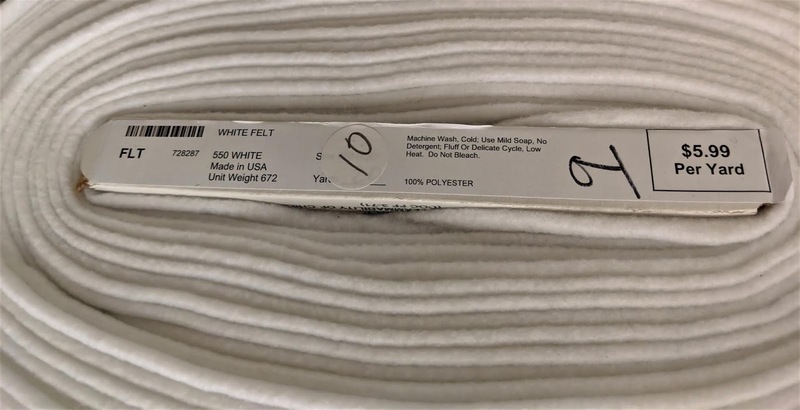 Felt truly makes a drapery panel that blocks out light, helps to prevent fading of your drapery fabric, also adds weight to create nice pleating and allows drapes to fall effortlessly to the floor. Why puddle? The puddle on a drapery panel creates more height on the drape, directing your eye upward. 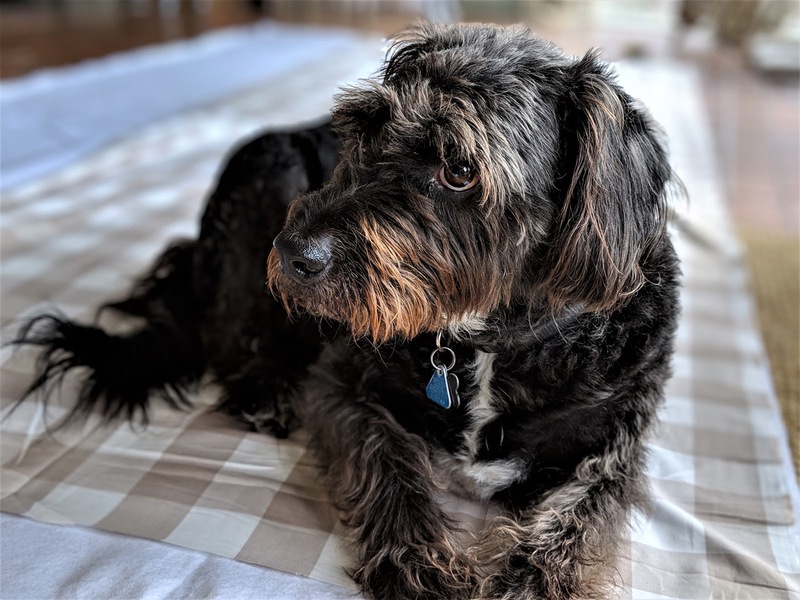 If you have a room with average height ceilings (as we do), puddling your drapes is a great way to add height to your room. I usually measure out one foot longer than my needed drapery length to puddle. I like the softness it lends to the room, the way the puddle marries the drapery panel to the floor, combined with the height it adds to the room. Puddling is certainly a personal choice. Our décor tends to be French inspired, puddles live well in that style. If you have a more modern, or farmhouse style puddles may not live well. I believe do what you like...me, I puddle everywhere! Additionally, hanging the panels as high and close to the ceiling as possible adds height. 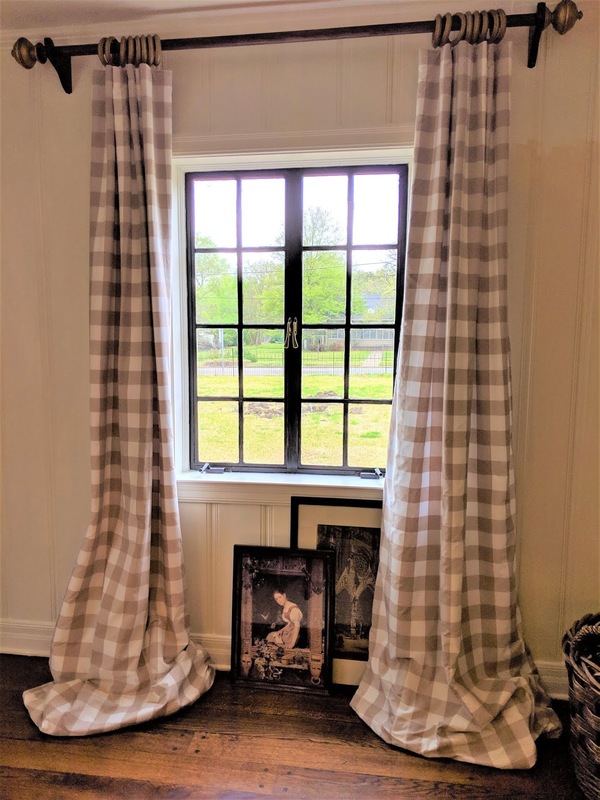 When hanging the rods high, you can create a blank wall space between the top of the window and the drapery rod depending upon how low on the wall your window begins. If the wall space isn't too large, over 16" high, I don't bother with it. I also prefer a informal approach to hanging method. I hang my straight top drapery panels from rings. I prefer the casual look of rings and loose way the panels pleat together over a more formal sewn pleated top that creates an even pleated drape. Our cottage architecture is English. I decided for our living room to make check drapes, a provincial design element to create more of a country feel to the living room. Our furniture is mostly antiques or estate finds. 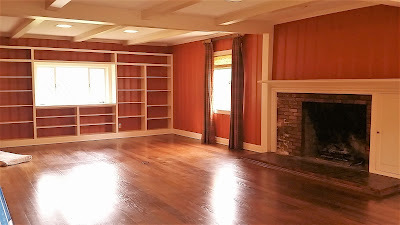 I want to reuse most of our collected items in our new cottage, even though a few are more formal. 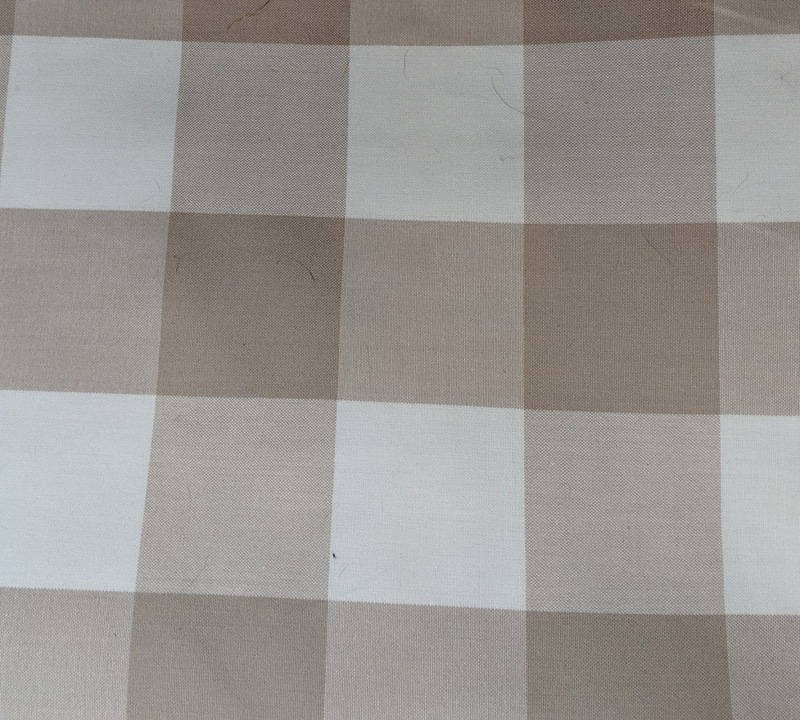 I chose a Kaufman fabric featuring a 2" square check. I wanted the check to be large enough to be obvious in the room. 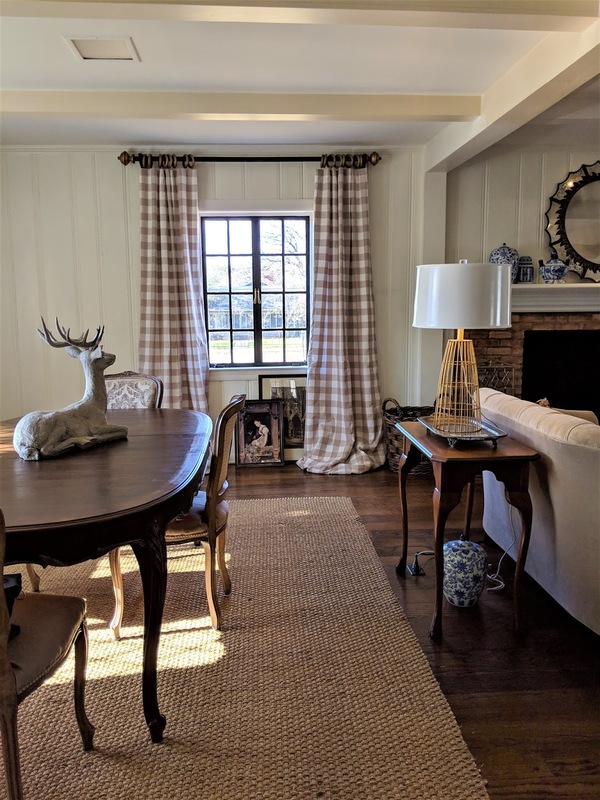 I wanted to avoid a large check like a Buffalo check which tends to be more "Modern Farmhouse". 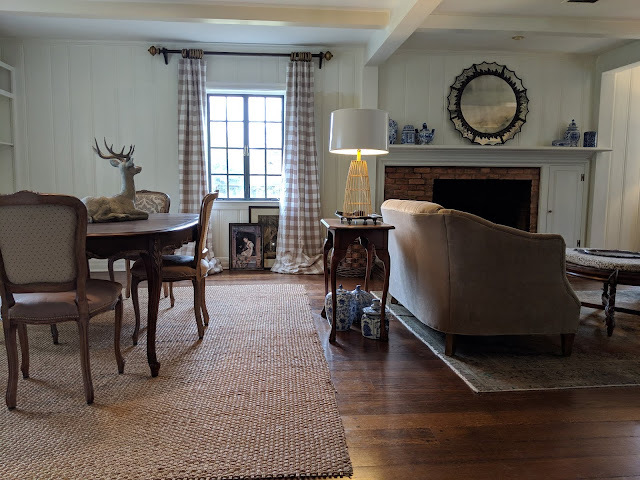 I wanted a traditional style check drape that speaks country cottage chic. 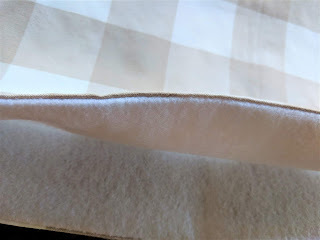 The colorway of the Kaufman fabric is "Doe", a medium taupe and soft white woven check. Our settee is taupe velvet. Our dining chairs are upholstered in a combination of taupe damask, a taupe harlequin, then finished off with a taupe velvet seat. 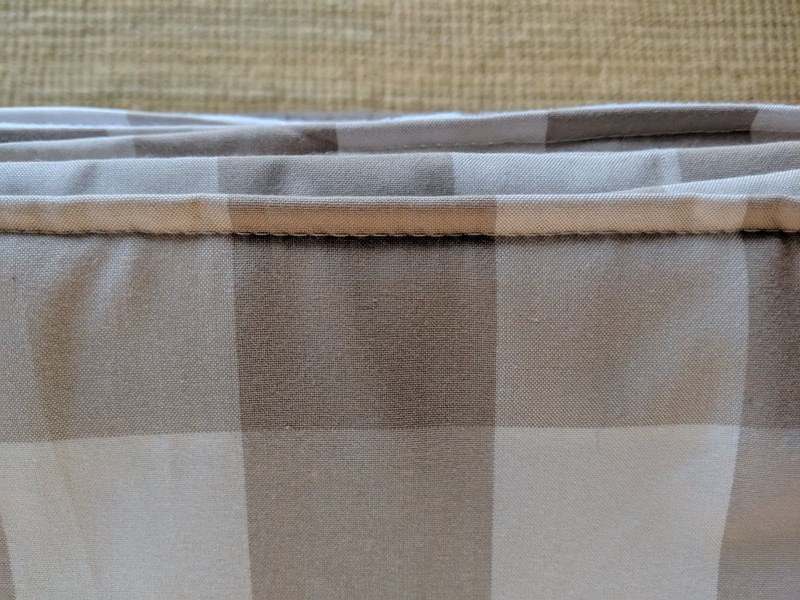 I chose the taupe check to add pattern to the living room, while relating the drapes to the largest pieces of soft furnishings in the space. In making this choice the elements of the room relate. Here I pinned the panels up to make certain the checks were going to work. 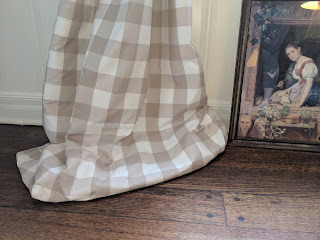 I sew my own drapery panels. I sew them lining attached to drapery fabric with no turned edge. I realize most drapes have a turned back edge, that shows upon the backside of the drape. From the exterior of the house I don't like seeing that little turned back edge which forms a stripe. 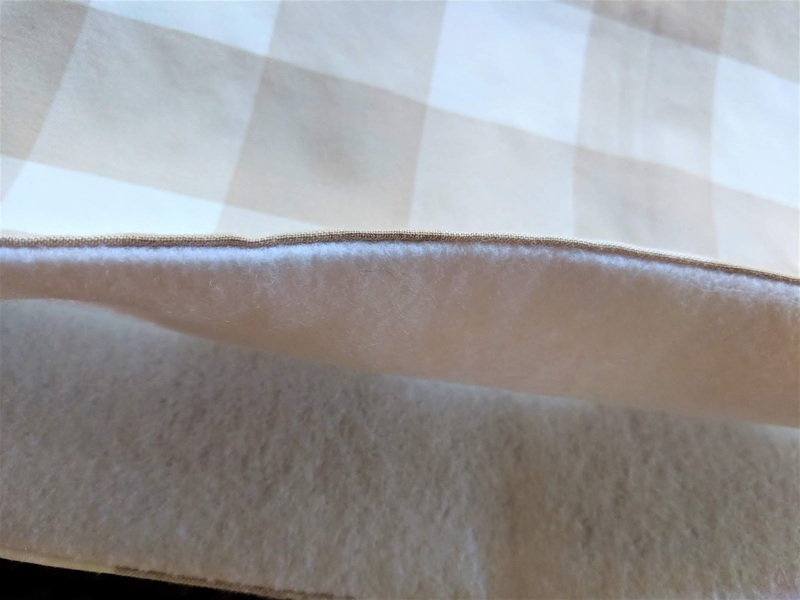 Additionally, that turn back edge will fade from sunlight, the fading will wander around the turned edge to the front of your drape, cause your drapery edge to be faded. I laid my felt out, then with right side down, laid out my check, pin the edges and sewed a small 1/4" straight seam. 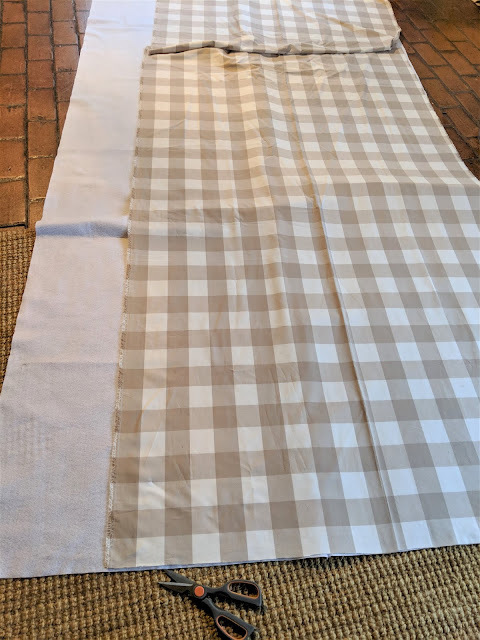 Sewing the two fabrics together, then turning them right side out creates a nice clean edge, making certain that the corner is pushed out creating a slightly rounded corner. I iron that edge to give my drapery panels a professional look. To finish off the drapes I turn the tops down to the inside, measuring about a half inch, with wrong sides together and run a straight seam, then iron again to finish off the top edge. Drapery rods are an expensive element to window treatments. 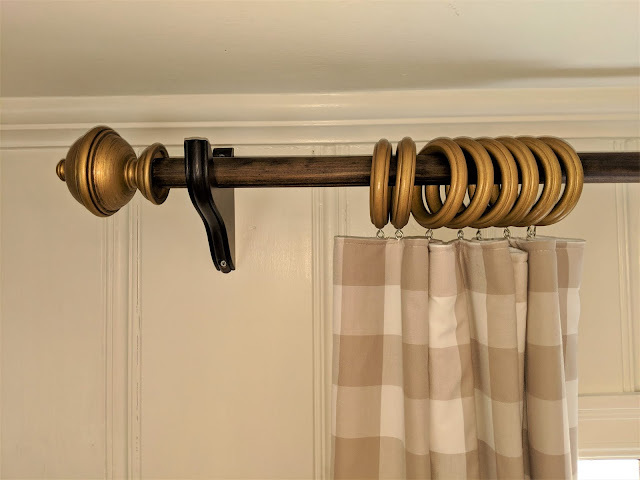 Rather than purchase precut, designer rods I use closet dowel purchased per foot from the local big box home improvement store. The rods come in two sizes, I use the largest 2" rod and cut them to the length I need. Then I stain them with a stain color that coordinates with my room, allowing me to customize the rods to our décor. 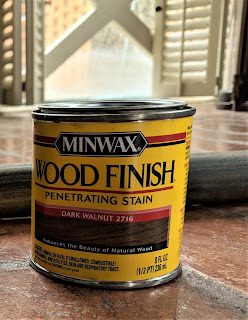 For our living room I used Minwax, Dark Walnut to match our floors. 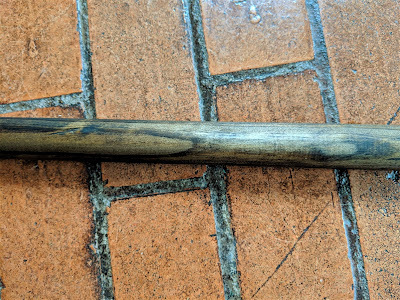 Wear gloves, the stain is oil based and will stain your hands. I use Playtex kitchen gloves and a soft lint free cloth, usually a tea towel to apply stain to the rods. 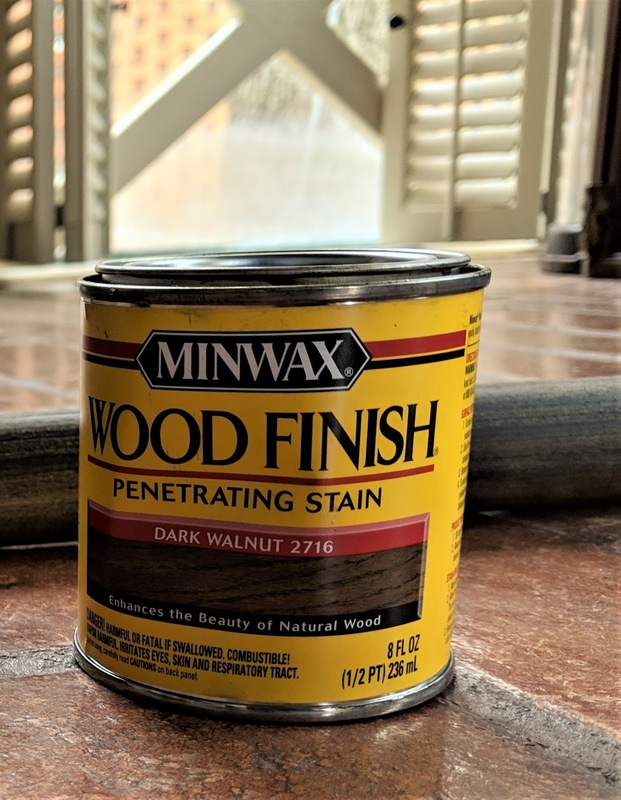 The end result is a sturdy, beautiful rod custom cut to the appropriate length, stained in a custom color for around $2.50 per linear foot. Much less than the usual $100. plus prices you'll pay for a sturdy designer drapery rod. We inherited gold drapery rings and finials from the previous owner. 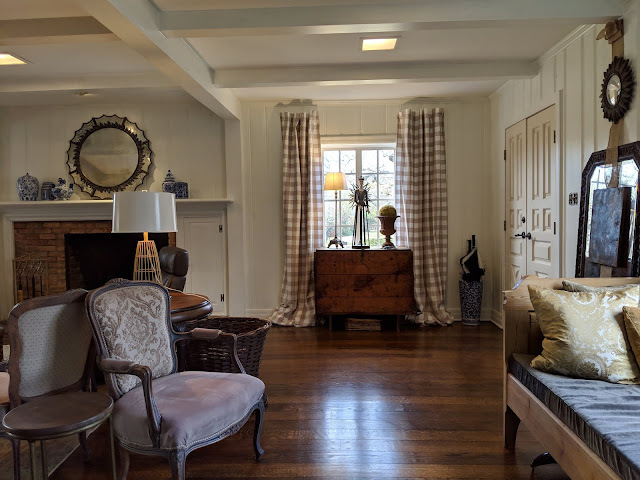 I chose to use the rings and finials to pick up the gold in the Aiden Gray lamps, gold on the window handles, also golden sunburst mirrors in the living room. Whenever possible repeating elements in a space creates a continuity and pulls the room together. The element doesn't have to be a large item it can be as subtle as repeating a finish like gold. I'm pleased with the check drapes. The pattern adds a little French country, provincial flare so common in the Charles Faudree design I've adored. 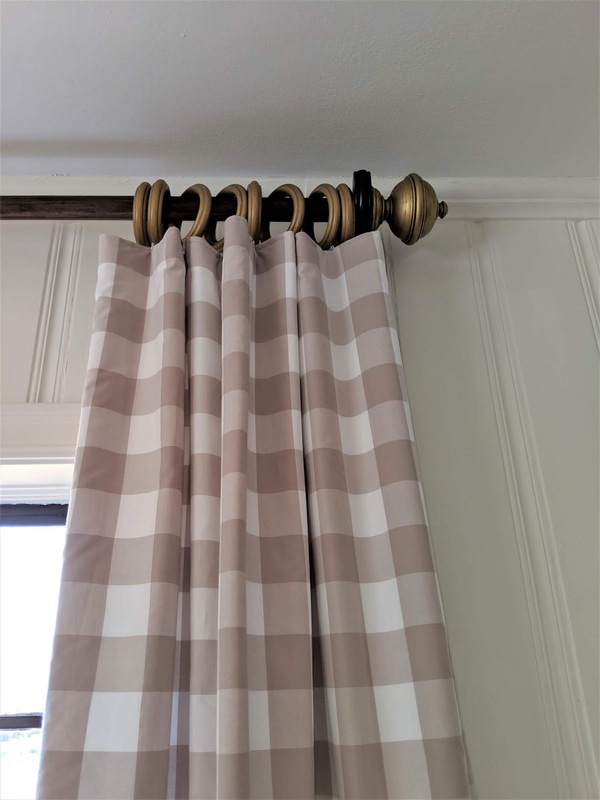 Using the taupe white check relates the drapes to the larger upholstered pieces of furniture in the room. The checks provide a hint of fun compared to the more luxurious velvet fabrics on the settee and dining chair seats. Things are beginning to come together, slowly. I'm admittedly not the most patient, or focused person in the world (Squirrel!). I'll keep trying to move forward. I'm currently searching for a living room rug. Needle in a haystack - While I'm searching I'll no doubt be detoured by a thought, an inspiration or whatever. Follow me on Instagram to keep up with day to day changes. Love your curtain panels. 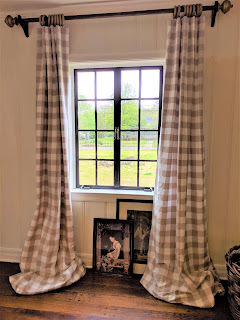 I've always made my own curtains until I decided that I wanted the same fabric for my living room that you chose. Decided for once to have them custom made. I really like them except the color looked terrible against the wood walls in the living room. Luckily, they looked and fit perfectly in the guestroom. Love your style. Charles Faudree was one of my favorite designers, too. Thank you for your blog. It's great. This is exactly what I want. 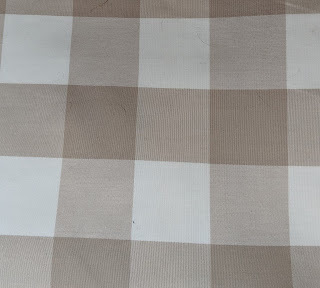 I want a poly fabric though to keep them from fading so badly. They look great!!!! Make me four panels please!!! ahahaha OH and the rods too. lol.